In honor of this being “Potty Training Awareness Month” we’re reminding you that Mansfield Plumbing offers the perfect way to entice children to “go on their own” — a child-sized toilet! 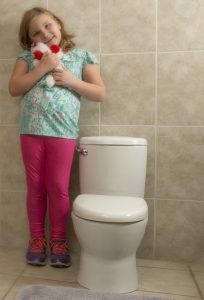 “Adult-sized toilets can be too high or large for children,” says Adriana Miller, product manager at Mansfield Plumbing. “They’re almost intimidating, and they can be unsafe due to their size.